Many congratulations to three students at the School of Welsh for winning the main literary prizes at the Intercollegiate Eisteddfod held at Swansea University in early March. The Chair was won by Gruffudd Antur who came to Bangor to do a Masters degree in Welsh after graduating in Physics at Aberystwyth last year. Gruffudd’s strict-metre poem, ‘Pelydrau’ (‘Rays’), described his feelings on leaving Aber after three years. In his adjudication, Alan Llwyd, called his work ‘thrilling’, naming Gruffudd ‘one of our best contemporary strict-metre poets’. The Drama Medal was won by Ffion Haf Williams, a finalist at the School of Welsh. 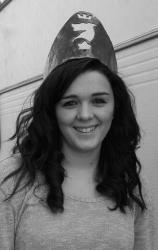 Ffion has followed several creative writing modules at the School in the course of her degree. Her play, ‘Liebestraum’, examines the relationship of Gwydion, a young pianist, and his former teacher, Noa, who is accused of abusing a student. Gruffudd Owen, the adjudicator, described it as a ‘tender drama’, written by a ‘confident playwright who fully understood the demands of the genre’. A student in her first year at the School, Elen Gwenllian Hughes of Pwllheli, won the Crown, beating thirty other contestants. Elen’s short story – a series of monologues on the theme of ‘Pellter’ (‘Distance’) – was praised by the adjudicator for being subtle, memorable and persuasive. The successes of Gruffudd, Ffion and Elen no doubt contributed to Bangor’s victorious general performance at the Intercollegiate Eisteddfod again this year.